Jimmy Kimmel, as he has been known to do, spent a large portion of his opening monologue on Tuesday saying mean things about Donald Trump. This time, the range of topics spanned from the release of James Comey’s new book to Trump’s apparent unwillingness to actually impose any of the sanctions on Russia that the government has announced. And, also, Kimmel spent a little time with a Baby Donald Trump to tell him all about the terrible things he’ll do in the future. “The big news today was the bigly-anticipated release of former FBI director James Comey’s book, in which he paints an unflattering portrait of his former boss. The president is said to be furious about the book because it combines the two things he hates most: criticism and reading,” Kimmel joked. 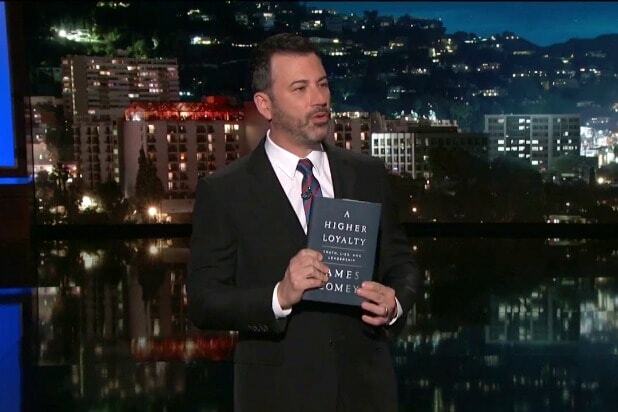 Then Kimmel traveled back in time to 1946, where we visited Baby Donald (a puppet) to tell him about the book as Baby Donald lay in his extraordinarily decadent crib. You can watch this bit right here below. Earlier in the monologue, Kimmel tore into Trump a bit for continuing to not institute sanctions against Russia. “President Trump did a little tap dance today – on those Russia sanctions he’s been talking so much about. He was supposed to impose tough new sanctions on Russia yesterday – but I guess decided not to go through with it. Why? No one knows – although I’m sure there’s a very good reason that has nothing at all to do with the Russians having any kind of anything he doesn’t want us to see on him,” Kimmel joked. Kimmel then examined that possibility that the pee tape is actually not real and maybe Putin really doesn’t have any blackmail material on Trump — and how much weirder that would be than the alternative. You can watch all of Tuesday’s episode of “Jimmy Kimmel Live” on ABC.com right here.